What if you found your true love only to be forced apart by an ignorant, intolerable society? For Hazel Johnson, falling in love with Mari McCray was a life-changing moment of self-discovery and freedom. It was also a love interrupted and it would take decades for this love story to come full circle. Admittedly, I don't review romance comics in general. 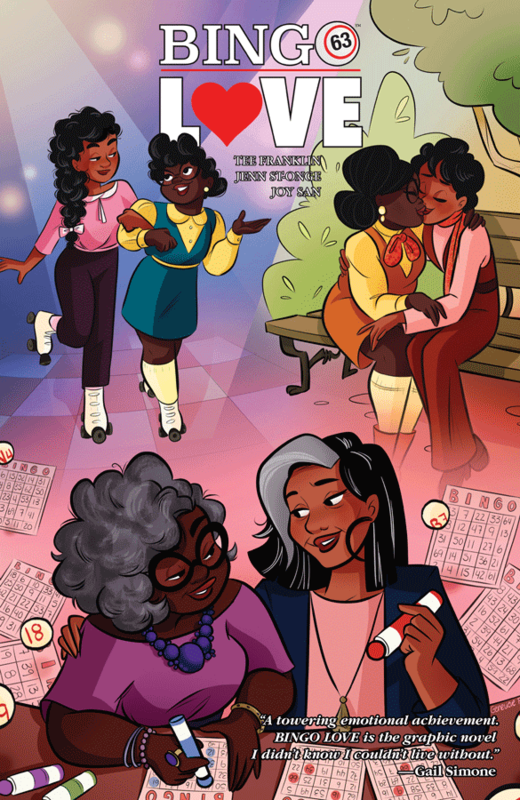 With so many superheroes, vampires, zombies, vigilantes, and sci-fi/fantasies being pumped out by so many publishers, beautifully sweet stories like 'Bingo Love' can get lost in the shuffle. Fortunately, creator Tee Franklin has been her own best champion launching a successful Kickstarter first and promoting her passion project all over social media. It caught the attention of many in the industry and now Image Comics has brought it to the masses this week in a graphic novel that demands attention. Hazel recounts her story of meeting Mari during the early sixties, first seeing her at bingo then at school where a friendship blossomed. Hazel is smitten but unsure if Mari feels the same way. It's a familiar dance we can all relate to when you haven't revealed your feelings to your crush in fear to be rejected. Happily, for Hazel, she didn't have to wait long before Mari came out to her. Jenn St-Onge's depiction of Hazel's joy will have you smiling uncontrollably. It's playfully and colorfully rendered evoking complete jubilation. Soon, their relationship is discovered and the two are torn apart by angry intolerable family members. Hazel is forced to conform to the role her family and society has etched out for her. She marries a man and raises a family. All the while, pining for the love she lost through no fault of her own. Decades pass until once again at bingo they are reunited. Their love rekindled and as strong as ever, it sends their respective lives upside down. Now in their sixties and in a much more socially acceptable and welcoming environment for queer women, they try and form the life they were stripped of having before. Franklin humanizes the struggle faced by gays and lesbians since forever of simply living a life out in the open free from prejudice and hate. She also demonstrates the bonds of love we all share for a soulmate. Hazel doesn't let Mari slip through her fingers again and it's that determination we root for, hoping they find happiness together once and for all. It's melodramatic at times but fast-paced with joyous art from St-Onge and colorist Joy San. St-Onge's style is robust and cartoonish filled with emotion and energy. The character designs are so varied portraying people of all shapes and sizes just like in real life. Black people come in all shades too and that's on display as well. San's bold vibrant colors punch up the roller coaster of emotional stakes. 'Bingo Love' is not perfect but love itself seldom is. It is an honest and heartfelt story that is inclusive. It's about love, about black love, about queer love and the universal desire to be true to yourself and your partner against all odds. Franklin pours her heart on the page and St-Onge/San bring it to glorious life. This is an essential landmark for what the future of diversity in comics looks like.